This may be the first time in history that a group of senators filibustered themselves. About 30 Democratic senators – calling themselves the Senate Climate Action Task Force – resolved to keep the senate open overnight Monday into Tuesday morning. “We’re not going to rest until Congress wakes up and acts on the most pressing issue of our time,” declared Sen. Brian Schatz (Hawaii), the organizer of the sleepless senators. 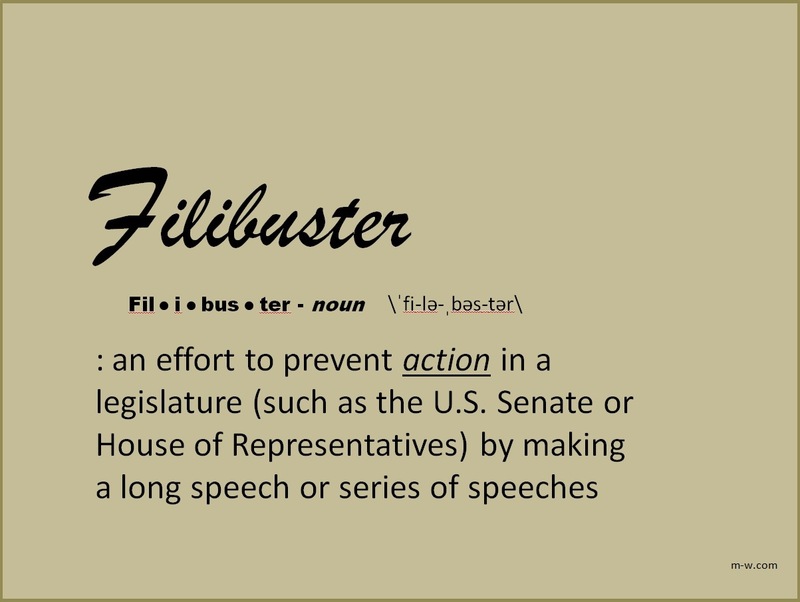 I may be late to this party, but I simply have to comment on the fact that the Senate Democrats filibustered themselves on so-called “global warming.” How can you filibuster when you are in the majority?! The idea that a majority party (majority: indicating more members than the minority party) would bluster about some topic – particularly one so devoid of any true importance – is asinine to say the least. Presuming that they actually WANT to do something about “climate change,” they should, as the majority party, present a resolution/bill/statement for signature in order to move their agenda along. But the problem is that that would mean they’ve actually DONE something, that they’ve actually made a stand (figuratively speaking in this case), that they’ve actually gone on record on an issue; and it’s obvious that giving the voters the impression that they are doing something constructive is much more valuable than actually doing something constructive. What is sad is that we all seem to know that today’s “leaders” are mere caricatures of the word as it has been known through history. Can you imagine Churchill (or even FDR) saying to Parliament, “I think that we ought to stay up all night talking to ourselves about the Nazi menace and its repulsive acts of genocide” instead of staking his character, reputation and entire self on rallying the people to the cause of decency, raising and supplying an army and sending them into battle? True leadership not only says something, but it DOES something; it takes a stand that can be seen and recorded. It makes plans to fix the issues with which it’s confronted then it puts those plans into action. On the other hand, the “leadership” of Harry Reid and his cronies stands in a place of unearned privilege and calls for action on something over which they already wield power. This kind of “leadership” is merely a façade or an illusion; it is a piece of illogic that shrouds itself in the robes of decency and merely makes a joke out of the true definition of the word. These senators are for all intents and purposes standing on the soapbox of history and thumbing their noses at the millennia of true leaders of the past. Sadly, I do know congress. I’ve watched as, even in my relatively short lifespan, congress has become more of a place of demagoguery than of action taken on behalf of the people. The sad truth is that this change has come as a matter of necessity because the culture has slowly resigned itself to the fact that congress no longer controls the laws of the nation nor does it control the purse-strings. Instead, we have seen the bureaucracy become so bloated and cumbersome that it exists outside of the control or will of the people. It rules by either judicial or executive fiat and governs by the whim of the regulator. The individual citizen now no longer has the recourse to vote out the bums who wronged him through poor governance, he is now slave (yes, I said “slave”) to the rubber stamp of the inspector. Furthermore, the congressional control of the finances of government now gives way to Continuing Resolution Authorities and insane can’t-shut-down-the-handouts-from-this-office mandates. This renders the senator or congressman moot in the grand scheme of things … and the voter senses it. And so, we get the familiar hands-in-the-pockets shrugging of shoulders, downward-cast face and dejected kick-of-a-rock when we hear about the complete inanity of the Senate Majority Leader leading a “filibuster” of himself. He (and they) can say all they want and it’s all just wasted breath. The real action will be taken by some over-zealous ideologue/regulator at the Department of Redundancy Department who is completely immune to the growing frustrations and destitution he is causing. Therefore – so I don’t get lumped in with the ineffectual, spineless, risk-nothing demagoguery of this and so many other generations of career politicians – let me go on record myself by providing a sure-fire fix for this silly and destructive abdication of leadership: Since the problem lies with an increasingly-resigned citizenry, the solution must also lie there. It’s not about anything draconian like overthrow or secession. It’s not even about sport-hunting the senators and congressmen in order to decrease incumbent reelection rates. The solution lies in people – normal people like you and me – being bold enough to speak truth in an era where truth is increasingly rare. In this case, we don’t even have to agree on what “right” is (though you know by now, I believe there is only one good and correct way to live: God’s way), the boldness to state the unequivocal is enough; the boldness (amazing that the word should even need to be used in this context) to use words by their actual definitions. By being willing to reveal the ignoble for what it is, by stepping out against dishonor, by taking a stand against shameful and reprehensible weakness and abdication of responsibility to lead, we – the normal, everyday citizen – reestablish the benchmark for boldness and accountability. After all, can a bold and dignified nation be led by a fearful and vile group of cowards? No. It simply cannot – cowards always give way before the bold. But a fearful and disgraceful nation can become captive to the liar and the cheat who hedges his words with inaction and risks only that which is placed naively in his hands by the unsuspecting. So don’t be unsuspecting. Realize now what it is that we are up against. It is the thinking of a bunch of post-modernist egotists that is the problem. When the government is overrun by people who believe that truth is a debatable thing and that it is only a fabrication of society or an extension of the power of those who govern, you can bet your next ten years’ worth of paychecks that tyranny will result. This post-modernist misery can be seen in the politician who tells you one thing (“If you like your doctor …”) but does another as much as in the politician that stands before his allies in government and “courageously” filibusters for action on something on which he refuses to take action himself. The smoke and mirrors have to be cleared away by the pure light of truth and the only way to direct its harsh glare into the dark, repulsive corners of tyranny is to stop allowing the nightmares of a world without truth to make their home in your own head.